"Philippe Auguste" redirects here. For the Paris Métro station, see Philippe Auguste (Paris Métro). Philip II (21 August 1165 – 14 July 1223), known as Philip Augustus (French: Philippe Auguste), was King of France from 1180 to 1223, the seventh from the House of Capet. His predecessors had been known as kings of the Franks, but from 1190 onward, Philip became the first French monarch to style himself "King of France". The son of King Louis VII and his third wife, Adela of Champagne, he was originally nicknamed Dieudonné (God-given) because he was a first son and born late in his father's life. Philip was given the epithet "Augustus" by the chronicler Rigord for having extended the crown lands of France so remarkably. The only known description of Philip describes him as "a handsome, strapping fellow, bald but with a cheerful face of ruddy complexion, and a temperament much inclined towards good-living, wine, and women. He was generous to his friends, stingy towards those who displeased him, well-versed in the art of stratagem, orthodox in belief, prudent and stubborn in his resolves. He made judgements with great speed and exactitude. Fortune's favorite, fearful for his life, easily excited and easily placated, he was very tough with powerful men who resisted him, and took pleasure in provoking discord among them. Never, however, did he cause an adversary to die in prison. He liked to employ humble men, to be the subduer of the proud, the defender of the Church, and feeder of the poor". After a twelve-year struggle with the Plantagenet dynasty in the Anglo-French War of 1202–14, Philip broke up the large Angevin Empire presided over by the crown of England and defeated a coalition of his rivals (German, Flemish and English) at the Battle of Bouvines in 1214. This victory would have a lasting impact on western European politics: the authority of the French king became unchallenged, while the English King John was forced by his barons to sign Magna Carta and deal with a rebellion against him aided by Philip, the First Barons' War. The military actions surrounding the Albigensian Crusade helped prepare the expansion of France southward. Philip did not participate directly in these actions, but he allowed his vassals and knights to help carry it out. Philip was born in Gonesse on 21 August 1165. King Louis VII intended to make his son Philip co-ruler with him as soon as possible, in accordance with the traditions of the House of Capet, but these plans were delayed when Philip, at the age of thirteen, was separated from his companions during a royal hunt and became lost in the Forest of Compiègne. He spent much of the following night attempting to find his way out, but to no avail. Exhausted by cold, hunger and fatigue, he was eventually discovered by a peasant carrying a charcoal burner, but his exposure to the elements meant he soon contracted a dangerously high fever. His father went on pilgrimage to the Shrine of Thomas Becket to pray for Philip's recovery and was told that his son had indeed recovered. However, on his way back to Paris, the king suffered a stroke. In declining health, Louis VII had his 14-year-old son crowned and anointed as king at Reims on 1 November 1179 by Archbishop William of the White Hands. He was married on 28 April 1180 to Isabelle of Hainaut, the daughter of Baldwin V, Count of Hainaut, and Margaret I, Countess of Flanders, who brought the County of Artois as her dowry. From the time of his coronation, all real power was transferred to Philip, as his father slowly descended into senility. The great nobles were discontented with Philip's advantageous marriage, while his mother and four uncles, all of whom exercised enormous influence over Louis, were extremely unhappy with his attainment of the throne, which caused a diminution of their power. Eventually, Louis died on 18 September 1180. While the royal demesne had increased under Philip I and Louis VI, it had diminished slightly under Louis VII. In April 1182, partially to enrich the French crown, Philip expelled all Jews from the demesne and confiscated their goods. Philip's eldest son Louis was born on 5 September 1187 and inherited the County of Artois in 1190, when his mother Isabelle died. The main source of funding for Philip's army was from the royal demesne. In times of conflict, he could immediately call up 250 knights, 250 horse sergeants, 100 mounted crossbowmen, 133 crossbowmen on foot, 2,000 foot sergeants, and 300 mercenaries. Towards the end of his reign, the king could muster some 3,000 knights, 9,000 sergeants, 6,000 urban militiamen, and thousands of foot sergeants. Using his increased revenues, Philip was the first Capetian king to build a French navy actively. By 1215, his fleet could carry a total of 7,000 men. Within two years, his fleet included 10 large ships and many smaller ones. In 1181, Philip began a war with Philip, Count of Flanders, over the Vermandois, which King Philip claimed as his wife's dowry and the Count was unwilling to give up. Finally the Count of Flanders invaded France, ravaging the whole district between the Somme and the Oise before penetrating as far as Dammartin. Notified of Philip's impending approach with 2,000 knights, he turned around and headed back to Flanders. Philip chased him, and the two armies confronted each other near Amiens. By this stage, Philip had managed to counter the ambitions of the count by breaking his alliances with Henry I, Duke of Brabant, and Philip of Heinsberg, Archbishop of Cologne. This, together with an uncertain outcome were he to engage the French in battle, forced the Count to conclude a peace. In July 1185, the Treaty of Boves left the disputed territory partitioned, with Amiénois, Artois, and numerous other places passing to the king, and the remainder, with the county of Vermandois proper, left provisionally to the Count of Flanders. It was during this time that Philip II was nicknamed "Augustus" by the monk Rigord for augmenting French lands. Meanwhile, in 1184, Stephen I, Count of Sancerre and his Brabançon mercenaries ravaged the Orléanais. Philip defeated him with the aid of the Confrères de la Paix. Philip also began to wage war with King Henry II of England, who was also Count of Anjou and Duke of Normandy and Aquitaine in France. The death of Henry's eldest son, Henry the Young King, in June 1183, began a dispute over the dowry of Philip's widowed sister Margaret. Philip insisted that the dowry should be returned to France as the marriage did not produce any children, per the betrothal agreement. The two kings would hold conferences at the foot of an elm tree near Gisors, which was so positioned that it would overshadow each monarch's territory, but to no avail. Philip pushed the case further when King Béla III of Hungary asked for the widow's hand in marriage, and thus her dowry had to be returned, to which Henry finally agreed. The death in 1186 of Henry's fourth son, Geoffrey II, Duke of Brittany, began a new round of disputes, as Henry insisted that he retain the guardianship of the duchy for his unborn grandson Arthur I, Duke of Brittany. Philip, as Henry's liege lord, objected, stating that he should be the rightful guardian until the birth of the child. Philip then raised the issue of his other sister, Alys, Countess of Vexin, and her delayed betrothal to Henry's son Richard I of England, nicknamed Richard the Lionheart. With these grievances, two years of combat followed (1186–1188), but the situation remained unchanged. Philip initially allied with Henry's young sons Richard the Lionheart and John Lackland, who were in rebellion against their father. Philip II launched an attack on Berry in the summer of 1187, but in June made a truce with Henry, which left Issoudun in his hands and also granted him Fréteval in Vendômois. Though the truce was for two years, Philip found grounds for resuming hostilities in the summer of 1188. He skilfully exploited the estrangement between Henry and Richard, and Richard did homage to him voluntarily at Bonsmoulins in November 1188. In 1189, Richard openly joined forces with Philip to drive Henry into abject submission. They chased him from Le Mans to Saumur, losing Tours in the process, before forcing him to acknowledge Richard as his heir. Finally, by the Treaty of Azay-le-Rideau (4 July 1189), Henry was forced to renew his own homage, confirm the cession of Issoudun to Philip (along with Graçay), and renounce his claim to suzerainty over Auvergne. Henry died two days later. His death, and the news of the fall of Jerusalem to Saladin, diverted attention from the Franco-English war. The Angevin kings of England (the line of rulers to which Henry II belonged), were Philip's most powerful and dangerous vassals as Dukes of Normandy and Aquitaine and Counts of Anjou. Philip made it his life's work to destroy Angevin power in France. One of his most effective tools was to befriend all of Henry's sons and use them to foment rebellion against their father. He maintained friendships with Henry the Young King and Geoffrey II until their deaths. Indeed, at the funeral of Geoffrey, he was so overcome with grief that he had to be forcibly restrained from casting himself into the grave. He broke off his friendships with Henry's younger sons Richard and John as each acceded to the English throne. 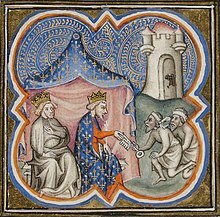 Philip (centre) and King Richard I of England accepting the keys to Acre; from the Grandes Chroniques de France in the Bibliothèque nationale de France. Philip travelled to the Holy Land to participate in the Third Crusade of 1189–1192 with King Richard I of England and Holy Roman Emperor Frederick I Barbarossa. His army left Vézelay on 1 July 1190. At first, the French and English crusaders travelled together, but the armies split at Lyon, after Richard decided to go by sea, whereas Philip took the overland route through the Alps to Genoa. The French and English armies were reunited in Messina, where they wintered together. On 30 March 1191, the French set sail for the Holy Land and Philip arrived on 20 May. He then marched to Acre, which was already under siege by a lesser contingent of crusaders, and he started to construct siege equipment before Richard arrived on 8 June. By the time Acre surrendered on 12 July, Philip was severely ill with dysentery, which reduced his zeal. Ties with Richard were further strained after the latter acted in a haughty manner after Acre fell to the crusaders. More importantly, the siege of Acre resulted in the death of Philip, Count of Flanders, who held the county of Vermandois proper. His death threatened to derail the Treaty of Gisors that Philip had orchestrated to isolate the powerful Blois-Champagne faction. Philip decided to return to France to settle the issue of succession in Flanders, a decision that displeased Richard, who said, "It is a shame and a disgrace on my lord if he goes away without having finished the business that brought him hither. But still, if he finds himself in bad health, or is afraid lest he should die here, his will be done." On 31 July 1191, the French army of 10,000 men (along with 5,000 silver marks to pay the soldiers) remained in Outremer under the command of Hugh III, Duke of Burgundy. Philip and his cousin Peter of Courtenay, Count of Nevers, made their way to Genoa and from there returned to France. The decision to return was also fuelled by the realisation that with Richard campaigning in the Holy Land, English possessions in northern France would be open to attack. After Richard's delayed return home, war between England and France would ensue over possession of English-controlled territories. The immediate cause of Philip's conflict with Richard the Lionheart stemmed from Richard's decision to break his betrothal with Phillip's sister Alys at Messina in 1191. Part of Alys's dowry that had been given over to Richard during their engagement was the territory of Vexin, which included the strategic fortress of Gisors. This should have reverted to Philip upon the end of the betrothal, but Philip, to prevent the collapse of the Crusade, agreed that this territory was to remain in Richard's hands and would be inherited by his male descendents. Should Richard die without an heir, the territory would return to Philip, and if Philip died without an heir, those lands would be considered a part of Normandy. Returning to France in late 1191, Phillip began plotting to find a way to have those territories restored to him. He was in a difficult situation, as he had taken an oath not to attack Richard's lands while he was away on crusade. The Third Crusade ordained territory was under the protection of the Church in any event. Philip had unsuccessfully asked Pope Celestine III to release him from his oath, was declined, forcing this caesar of France to build his own casus belli. On 20 January 1192, Philip met with William FitzRalph, Richard's seneschal of Normandy. Presenting some documents purporting to be from Richard, Philip claimed that the English king had agreed at Messina to hand disputed lands over to France. Not having heard anything directly from their sovereign, FitzRalph and the Norman barons rejected Philip's claim to Vexin. Philip at this time also began spreading rumours about Richard's action in the east to discredit the English king in the eyes of his subjects. Among the stories Philip invented included Richard involved in treacherous communication with Saladin, alleging he had conspired to cause the fall of Gaza, Jaffa, and Ashkelon, and that he had participated in the murder of Conrad of Montferrat. Finally, Philip made contact with Prince John, Richard's brother, whom he convinced to join the conspiracy to overthrow the legitimate king of England. At the start of 1193, Prince John visited Philip in Paris, where he paid homage for Richard's continental lands. When word reached Philip that Richard had finished crusading and had been captured on his way back from the Holy Land, he promptly invaded Vexin. His first target was the fortress of Gisors, commanded by Gilbert de Vascoeuil, which surrendered without putting up a struggle. Philip then penetrated deep into Normandy, reaching as far as Dieppe. To keep the duplicitous John on his side, Philip entrusted him with the defence of the town of Évreux. Meanwhile, Philip was joined by Count Baldwin of Flanders, and together they laid siege to Rouen, the ducal capital of Normandy. Here, Philip's advance was halted by a defence led by the Earl of Leicester. Unable to penetrate this defence, Philip moved on. At Mantes on 9 July 1193, Philip came to terms with Richard's ministers, who agreed that Philip could keep his gains and would be given some extra territories if he ceased all further aggressive actions in Normandy, along with the condition that Philip would hand back the captured territory if Richard would pay homage. To prevent Richard from spoiling their plans, Philip and John attempted to bribe Holy Roman Emperor Henry VI in order to keep the English king captive for a little while longer. Henry refused, and Richard was released from captivity on 4 February 1194. By 13 March Richard had returned to England, and by 12 May he had set sail for Normandy with some 300 ships, eager to engage Philip in war. Philip had spent this time consolidating his territorial gains and by now controlled much of Normandy east of the Seine, while remaining within striking distance of Rouen. His next objective was the castle of Verneuil, which had withstood an earlier siege. Once Richard arrived at Barfleur, he soon marched towards Verneuil. As his forces neared the castle, Philip, who had been unable to break through, decided to strike camp. Leaving a large force behind to prosecute the siege, he moved off towards Évreux, which Prince John had handed over to his brother to prove his loyalty. Philip retook the town and sacked it, but during this time, his forces at Verneuil abandoned the siege, and Richard entered the castle unopposed on 30 May. Throughout June, while Philip's campaign ground to a halt in the north, Richard was taking a number of important fortresses to the south. Philip, eager to relieve the pressure off his allies in the south, marched to confront Richard's forces at Vendôme. Refusing to risk everything in a major battle, Philip retreated, only to have his rear guard caught at Fréteval on 3 July. This turned into a general encounter in which Philip barely managed to avoid capture as his army was put to flight. Fleeing back to Normandy, Philip avenged himself on the English by attacking the forces of Prince John and the Earl of Arundel, seizing their baggage train. By now both sides were tiring, and they agreed to the temporary Truce of Tillières. War continually raged during 1195, when Philip once again besieged Verneuil. Richard arrived to discuss the situation face to face. During negotiations, Philip secretly continued his operations against Verneuil; when Richard found out, he left, swearing revenge. Philip now pressed his advantage in northeastern Normandy, where he conducted a raid at Dieppe, burning the English ships in the harbour while repulsing an attack by Richard at the same time. Philip now marched southward into the Berry region. His primary objective was the fortress of Issoudun, which had just been captured by Richard's mercenary commander, Mercadier. The French king took the town and was besieging the castle when Richard stormed through French lines and made his way in to reinforce the garrison, while at the same time another army was approaching Philip's supply lines. Philip called off his attack, and another truce was agreed. The war slowly turned against Philip over the course of the next three years. Political and military conditions seemed promising at the start of 1196, when Richard's nephew Arthur I, Duke of Brittany ended up in Philip's hands, and he won the Siege of Aumale, but Philip's good fortune did not last. Richard won over a key ally, Baldwin of Flanders, in 1197. Then, in 1198, Holy Roman Emperor Henry VI died. His successor was to be Otto IV, Richard's nephew, who put additional pressure on Philip. Finally, many Norman lords were switching sides and returning to Richard's camp. This was the state of affairs when Philip launched his campaign of 1198 with an attack on Vexin. He was pushed back and then had to deal with the Flemish invasion of Artois. On 27 September, Richard entered Vexin, taking Courcelles-sur-Seine and Boury-en-Vexin before returning to Dangu. Philip, believing that Courcelles was still holding out, went to its relief. Discovering what was happening, Richard decided to attack the French king's forces, catching Philip by surprise. Philip's forces fled and attempted to reach the fortress of Gisors. Bunched together, the French knights with king Philip attempted to cross the Epte River on a bridge that promptly collapsed under their weight, almost drowning Philip in the process. He was dragged out of the river and shut himself up in Gisors. Philip soon planned a new offensive, launching raids into Normandy and again targeting Évreux. Richard countered Philip's thrust with a counterattack in Vexin, while Mercadier led a raid on Abbeville. The upshot was that by the autumn 1198, Richard had regained almost all that had been lost in 1193. In desperate circumstances, Philip offered a truce so that discussions could begin towards a more permanent peace, with the offer that he would return all of the territories except for Gisors. In mid-January 1199, the two kings met for a final meeting, Richard standing on the deck of a boat, Philip standing on the banks of the Seine River. Shouting terms at each other, they could not reach agreement on the terms of a permanent truce, but they did agree to further mediation, which resulted in a five-year truce that held. Later in 1199, Richard was killed during a siege involving one of his vassals. In May 1200, Philip signed the Treaty of Le Goulet with Richard's successor John Lackland. The treaty was meant to bring peace to Normandy by settling the issue of its much-reduced boundaries. The terms of John's vassalage were not only for Normandy, but also for Anjou, Maine, and Touraine. John agreed to heavy terms, including the abandonment of all the English possessions in Berry and 20,000 marks of silver, while Philip in turn recognised John as king of England, formally abandoning Arthur of Brittany's candidacy, whom he had hitherto supported, recognising instead John's suzerainty over the Duchy of Brittany. To seal the treaty, a marriage between Blanche of Castile, John's niece, and Louis the Lion, Philip's son, was contracted. This agreement did not bring warfare to an end in France, however, since John's mismanagement of Aquitaine led the province to erupt in rebellion later in 1200, a disturbance that Philip secretly encouraged. To disguise his ambitions, Philip invited John to a conference at Andely and then entertained him at Paris, and both times he committed to complying with the treaty. In 1202, disaffected patrons petitioned the French king to summon John to answer their charges in his capacity as John's feudal lord in France. John refused to appear, so Philip again took up Arthur of Brittany's claims to the English throne and betrothed his six-year-old daughter Marie. In riposte John crossed over into Normandy. His forces soon captured Arthur, and in 1203, the young man disappeared, with most people believing that John had had him murdered. The outcry over Arthur's fate saw an increase in local opposition to John, which Philip used to his advantage. He took the offensive and, apart from a five-month siege of Andely, swept all before him. After Andely surrendered, John fled to England. By the end of 1204, most of Normandy and the Angevin lands, including much of Aquitaine, had fallen into Philip's hands. What Philip had gained through victory in war, he sought to confirm by legal means. Philip, again acting as John's liege lord over his French lands, summoned him to appear before the Court of the Twelve Peers of France to answer for the murder of Arthur of Brittany. John requested safe conduct, but Philip only agreed to allow him to come in peace, while providing for his return only if it were allowed to after the judgment of his peers. Not willing to risk his life on such a guarantee, John refused to appear, so Philip summarily dispossessed the English of all lands. Pushed by his barons, John eventually launched an invasion of northern France in 1206. He disembarked with his army at La Rochelle during one of Philip's absences, but the campaign was a disaster. After backing out of a conference that he himself had demanded, John eventually bargained at Thouars for a two-year truce, the price of which was his agreement to the chief provisions of the judgment of the Court of Peers, including a loss of his patrimony. In 1208, Philip of Swabia, the successful candidate to assume the throne of the Holy Roman Empire, was assassinated. As a result, the imperial crown was given to his rival Otto IV, the nephew of King John. Otto, prior to his accession, had promised to help John recover his lost possessions in France, but circumstances prevented him from making good on his promise. By 1212, both John and Otto were engaged in power struggles against Pope Innocent III: John over his refusal to accept the papal nomination for the Archbishop of Canterbury, and Otto over his attempt to strip Frederick II, King of the Germans (and later Holy Roman Emperor), of his Sicilian crown. Philip decided to take advantage of this situation, first in Germany, where he aided German noble rebellion in support of the young Frederick. John immediately threw England's weight behind Otto, and Philip now saw his chance to launch a successful invasion of England. In order to secure the cooperation of all his vassals in his plans for the invasion, Philip denounced John as an enemy of the Church, thereby justifying his attack as motivated solely by religious scruples. He summoned an assembly of French barons at Soissons, which was well attended with the exception of Ferdinand, Count of Flanders. Ferdinand refused to attend, still angry over the loss of the towns of Aire and Saint-Omer that had been captured by Philip's son Louis the Lion. He would not participate in any campaign until restored to all ancient lands. Philip was eager to prove his loyalty to Rome and thus secure papal support for his planned invasion, announced at Soissons a reconciliation with his estranged wife Ingeborg of Denmark, which the popes had been promoting. The barons fully supported his plan, and they all gathered their forces and prepared to join with Philip at the agreed rendezvous. Through all of this, Philip remained in constant communication with Pandulf Verraccio, the papal legate, who was encouraging Philip to pursue his objective. Verraccio however was also holding secret discussions with King John. Advising the English king of his precarious predicament, he persuaded John to abandon his opposition to papal investiture and agreed to accept the papal legate's decision in any ecclesiastical disputes as final. In return, the pope agreed to accept the Kingdom of England and the Lordship of Ireland as papal fiefs, which John would rule as the pope's vassal, and for which John would do homage to the pope. No sooner had the treaty between John and the pope been ratified in May 1213 than Verraccio announced to Philip that he would have to abandon his expedition against John, since to attack a faithful vassal of the Holy See would constitute a mortal sin. Philip argued in vain that his plans had been drawn up with the consent of Rome, that his expedition was in support of papal authority that he only undertook on the understanding that he would gain a plenary indulgence; he had spent a fortune preparing for the expedition. The papal legate remained unmoved, but Verraccio did suggest an alternative. The Count of Flanders had denied Philip's right to declare war on England while King John was still excommunicated, and that his disobedience needed to be punished. Philip eagerly accepted the advice, and quickly marched at the head of his troops into the territory of Flanders. The French fleet, reportedly numbering some 1,700 ships, proceeded first to Gravelines and then to the port of Dam. Meanwhile, the army marched by Cassel, Ypres, and Bruges before laying siege to Ghent. Hardly had the siege begun when Philip learned that the English fleet had captured a number of his ships at Dam and that the rest were so closely blockaded in its harbor that it was impossible for them to escape. After having obtained 30,000 marks as a ransom for the hostages he had taken from the Flemish cities he had captured, Philip quickly retraced his steps to reach Dam. It took him two days, arriving in time to relieve the French garrison, but he discovered he could not rescue his fleet. He ordered it to be burned to prevent it from falling into enemy hands, then he ordered the town of Dam to be burned as well. Determined to make the Flemish pay for his retreat, he ordered that all towns be razed and burned in every district he passed through, and that the peasantry be either killed or sold as slaves. The destruction of the French fleet had once again raised John's hopes, so he began preparing for an invasion of France and a reconquest of his lost provinces. The English barons were initially unenthusiastic about the expedition, which delayed his departure, so it was not until February 1214 that he disembarked at La Rochelle. John was to advance from the Loire, while his ally Otto IV made a simultaneous attack from Flanders, together with the Count of Flanders. Unfortunately, the three armies could not coordinate their efforts effectively. It was not until John had been disappointed in his hope for an easy victory after being driven from Roche-au-Moine and had retreated to his transports that the Imperial Army, with Otto at its head, assembled in the Low Countries. On 27 July 1214, the opposing armies suddenly discovered that they were in close proximity to one another, on the banks of a little tributary of the River Lys, near the bridge at Bouvines. It being a Sunday, Philip did not expect the allied army to attack, as it was considered unholy to fight on the Sabbath. Philip's army numbered some 7,000, while the allied forces possessed around 9,000 troops. The armies clashed at what became known as the Battle of Bouvines. Philip was unhorsed by the Flemish pikemen in the heat of battle, and were it not for his mail armor he would have probably been killed. When Otto was carried off the field by his wounded and terrified horse, and the Count of Flanders was severely wounded and taken prisoner, the Flemish and Imperial troops saw that the battle was lost, turned, and fled the field. The French troops began pursuing them, but with night approaching, and with the prisoners they already had too numerous and, more importantly, too valuable to risk in a pursuit, Philip ordered a recall with the trumpets before his troops had moved little more than a mile from the battlefield. Philip returned to Paris triumphant, marching his captive prisoners behind him in a long procession, as his grateful subjects came out to greet the victorious king. In the aftermath of the battle, Otto retreated to his castle of Harzburg and was soon overthrown as Holy Roman Emperor, to be replaced by Frederick II. Count Ferdinand remained imprisoned following his defeat, while King John's attempt to rebuild the Angevin Empire ended in complete failure. Philip's decisive victory was crucial in shaping Western European politics in both England and France. In England, the defeated John was so weakened that he was soon required to submit to the demands of his barons and sign Magna Carta, which limited the power of the crown and established the basis for common law. In France, the battle was instrumental in forming the strong central monarchy that would characterise its rule until the first French Revolution. After the early death of Isabella of Hainaut in childbirth in 1190, Philip decided to marry again. On 15 August 1193, he married Ingeborg, daughter of King Valdemar I of Denmark. She was renamed Isambour, and Stephen of Tournai described her as "very kind, young of age but old of wisdom." Phillip, however, discovered on their wedding night that she had terribly bad breath, and he refused to allow her to be crowned queen. Ingeborg protested at this treatment; his response was to confine her to a convent. He then asked Pope Celestine III for an annulment on the grounds of non-consummation. Philip had not reckoned with Isambour, however; she insisted that the marriage had been consummated, and that she was his wife and the rightful queen of France. The Franco-Danish churchman William of Paris intervened on the side of Ingeborg, drawing up a genealogy of the Danish kings to disprove the alleged impediment of consanguinity. In the meantime, Philip had sought a new bride. Initial agreement had been reached for him to marry Margaret of Geneva, daughter of William I, Count of Geneva, but the young bride's journey to Paris was interrupted by Thomas, Count of Savoy, who kidnapped Philip's intended new queen and married her instead, claiming that Philip was already bound in marriage. Philip finally achieved a third marriage on 7 May 1196, when he was married to Agnes of Merania from Dalmatia. Their children were Marie and Philip, Count of Clermont, and, by marriage, Count of Boulogne. Pope Innocent III declared Philip Augustus' marriage to Agnes of Merania null and void, as he was still married to Ingeborg. He ordered the king to part from Agnes, and when he did not, the pope placed France under an interdict in 1199. This continued until 7 September 1200. Due to pressure from the pope and from Ingeborg's brother King Valdemar II of Denmark, Philip finally took Isambour back as his wife in 1201, but it would not be until 1213 that she would be recognized at court as queen. Louis VIII (5 September 1187 – 8 November 1226), King of France (1223-1226); married Blanche of Castile and had issue. Marie (1198 – 15 August 1238); married firstly Philip I of Namur, had no issue. Married secondly Henry I, Duke of Brabant, had issue. Philip (July 1200 – 14/18 January 1234), Count of Boulogne by marriage; married Matilda II, Countess of Boulogne and had issue. Pierre Charlot, bishop of Noyon. When Pope Innocent III called for a crusade against the "Albigensians," or Cathars, in Languedoc in 1208, Philip did nothing to support it, though he did not stop his nobles from joining in. The war against the Cathars did not end until 1244, when their last strongholds were finally captured. The fruits of the victory, the submission of the south of France to the crown, were to be reaped by Philip's son Louis VIII and grandson Louis IX. From 1216 to 1222, Philip also arbitrated in the War of the Succession of Champagne and finally helped the military efforts of Eudes III, Duke of Burgundy, and Holy Roman Emperor Frederick II to bring it to an end. Philip II Augustus played a significant role in one of the greatest centuries of innovation in construction and education in France. With Paris as his capital, he had the main thoroughfares paved, built a central market, Les Halles, continued the construction begun in 1163 of Notre-Dame de Paris, constructed the Louvre as a fortress, and gave a charter to the University of Paris in 1200. Under his guidance, Paris became the first city of teachers the medieval world knew. In 1224, the French poet Henry d'Andeli wrote of the great wine tasting competition that Philip II Augustus commissioned, the Battle of the Wines. Philip II Augustus died on 14 July 1223 at Mantes-la-Jolie and was interred in the Basilica of St Denis. Philip's son by Isabella of Hainaut, Louis VIII, was his successor. King Philip appears in William Shakespeare's historical play The Life and Death of King John. Sir Walter Scott's novel The Talisman, depicts deceit and disunity among the leaders of the Third Crusade, including Philip, Richard I of England, and Leopold V of Austria. In King Richard and the Crusaders (1954), a film based on Scott's The Talisman, King Philip, portrayed by Henry Corden, conspires with Conrad of Montferrat (Michael Pate) against Richard the Lionheart (George Sanders). In the 1935 Cecil B. DeMille film The Crusades, he was portrayed by C. Henry Gordon. King Philip also appears in James Goldman's 1966 Broadway Production of The Lion in Winter and was portrayed by Christopher Walken, as well as the 1968 Academy Award-winning film of the same name, with Timothy Dalton playing the role. In the 2003 remake starring Patrick Stewart and Glenn Close, he is played by Jonathan Rhys Meyers. King Philip also appears in Ridley Scott's 2010 movie Robin Hood. King Philip appears in Sharon Kay Penman's novels The Devil's Brood and Lionheart. King Philip appears in Judith Koll Healey's novel The Rebel Princess. King Philip appears in the game Stronghold: Crusader. He is portrayed as a somewhat weak ruler who is rather reckless in battle with his knights. King Philip appears in the game Genghis Khan II: Clan of the Gray Wolf as the head of the Capetian dynasty. He is the only ruler with an A in politics and a B in everything else. King Philip appears in Age of Empires II in a campaign mission based on the Conquest of Cyprus. ^ Cullum, P.; Lewis, K., eds. (2004). Holiness and Masculinity in the Middle Ages. Religion and Culture in the Middle Ages. University of Wales Press. p. 135. ISBN 978-0-7083-1894-2. Retrieved 2012-11-22. [...] Philip Augustus 'Dieudonné', [...] as this epithet demonstrates, was thought to have been given to Louis VII by God, because Louis had been married three times and had to wait many years for the birth of a son. ^ Bradbury 1997, p. 252. ^ Bradbury 1997, p. 280. ^ Bradbury 1997, p. 242. ^ Bradbury 1997, p. 245. ^ Verbruggen 1997, pp. 245–247. ^ Verbruggen 1997, p. 253. ^ a b c Verbruggen 1997, p. 255. ^ Backman, Clifford. The Worlds of Medieval Europe. ^ Bradbury 1997, p. 185. ^ Bradbury 1997, p. 55-56. ^ Bradbury 1997, p. 177. ^ M. A. Pollock, Scotland, England and France After the Loss of Normandy, 1204-1296, (The Boydell Press, 2015), 53. ^ Charles T. Wood, The French Apanages and the Capetian Monarchy: 1224-1328, (Harvard University Press, 1966), 9. ^ Jim Bradbury, Philip Augustus:King of France 1180-1223, (Addison Wesley Longman Limited, 1998), 185. ^ C. Petit-Dutaillis, The Feudal Monarchy in France and England, transl. E.D. Hunt, (Routledge, 1999), 229. ^ Rodney Stark, For the glory of God, (Princeton University Press, 2003), 56. ^ Jill N. Claster, Sacred Violence: The European Crusades to the Middle East, 1095-1396, (University of Toronto Press, 2009), 220. ^ Randall Fegley, The Golden Spurs of Kortrijk: How the Knights of France Fell to the Foot Soldiers of Flanders, 64-65. ^ Randall Fegley, The Golden Spurs of Kortrijk: How the Knights of France Fell to the Foot Soldiers of Flanders, (McFarland & Company, Inc., 2002), 63. ^ Randall Fegley, The Golden Spurs of Kortrijk: How the Knights of France Fell to the Foot Soldiers of Flanders, 62. ^ John W. Baldwin, The Government of Philip Augustus: Foundations of French Royal Power in the Middle Ages, (University of California Press, 1986), 389. ^ "King Richard and the Crusaders" – via www.imdb.com. Bradbury, J. (1997-11-11). 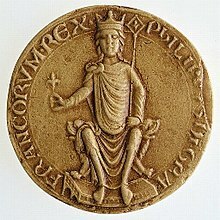 Philip Augustus: King of France 1180–1223. The Medieval World (1st ed.). Routledge. ISBN 978-0-582-06059-3. Duby, G. (September 1, 1990). The Legend of Bouvines: War, Religion, and Culture in the Middle Ages (first ed.). Univ of California Press. ISBN 0520062388. Horne, Alistair (2004). La Belle France: A Short History. Alfred A. Knopf. Meade, Marion (1977). Eleanor of Aquitaine: A Biography. New York: Hawthorn Books. ISBN 0-8015-2231-5. Morris, Marc (2015). King John: Treachery and Tyranny in Medieval England: The Road to Magna Carta. Pegasus Books. ISBN 9781605988856. Payne, Robert (1984). The Dream and the Tomb: A History of the Crusades. New York: Stein and Day. ISBN 0-8128-2945-X. Rees, Simon (2006-08-23). "King Richard I of England Versus King Philip II Augustus". Military History (published September 2006). Archived from the original on 5 May 2008. Richard, Jean (1983). "Philippe Auguste, la croisade et le royaume". Croisés, Missionaires et Voyageurs. Perspectives Orientales du Monde Latin Médiéval (in French). London: Variorum Collected Studies Series CS182. Smedley, E. (1836). The History of France, from the final partition of the Empire of Charlemagne, A.D. 843, to the Peace of Cambray, A.D. 1529. 1. London: Baldwin and Cradock. Verbruggen, J. F. (1997) . De Krijgskunst in West-Europa in de Middeleeuwen, IXe tot begin XIVe eeuw [The Art of Warfare in Western Europe During the Middle Ages: From the Eighth Century to 1340]. Translated by Willard, S. (2nd ed.). Suffolk: Boydell Press. ISBN 0 85115 630 4. Chisholm, H., ed. (1911). "Philip II (1165–1223)" . Encyclopædia Britannica 11th ed. 21. Cambridge University Press. Lundy, Darryl (ed.). "Philippe II Auguste Capet, Roi de France". The Peerage. Goyau, G. (1911). "Philip II (Augustus)". In Herbermann, Charles. Catholic Encyclopedia. 12. New York: Robert Appleton Company. Pacaut, M. (1998-07-20). "Philip II, king of France". Encyclopædia Britannica. "The 'War' of Bouvines (1202–1214)". Archived from the original on 11 July 2017. Retrieved 29 September 2008. Wikimedia Commons has media related to Philip II of France.